Human anagen hair follicle bulge is defined by the distribution of LRCs. (A) Vertical section of human hair follicle. 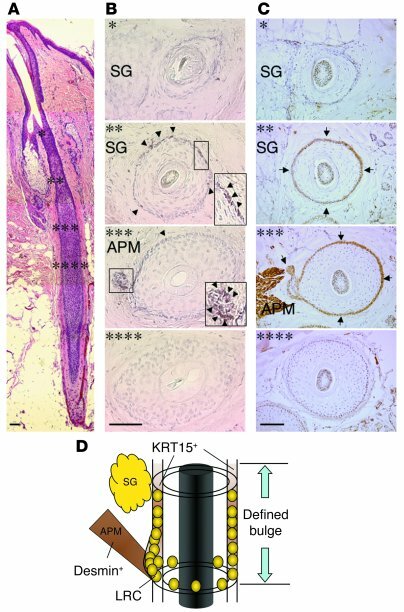 (B) In xenografted human scalp tissue, BrdU-labeled LRCs (arrowheads) were predominantly detected in the outermost layer of ORS between the insertion point of the arrector pili muscle (APM) and the sebaceous gland (SG) level. (C) The distribution of LRCs in the human hair follicle defines the bulge and can be detected immunohistochemically (arrows) by the cocktail of antibodies containing C8/144B (cross-reactive to KRT15 in ORS) and D33 (anti-desmin). Asterisks in the transverse sections in both B and C indicate their locations within the vertical hair follicle section in A. (D) Schema of the defined human hair follicle bulge. Scale bars: 50 μm.